RBNY vs Impact : Victoire! 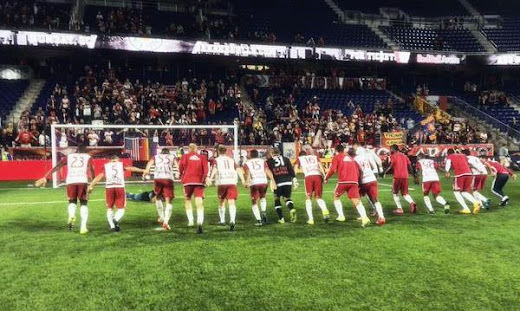 We suffered but, in the end, it was three more points to the good as the New York Red Bulls defeated the Montreal Impact 2-1. Another step forward in our "Supporter's Shield" campaign (we're the favourites at this point) and only one point, in our final three games, needed to win the East. It wasn't simple, as Montreal has come alive after the acquisition of Didier Drogba, but the Red Bulls managed to take the lead through a Sacha Klejstan penalty (after Montreal's Ambroise Oyongo handled in the box). Oyongo was shown red on the play and the Red Bulls found themselves up 1-nil, with a man advantage. Sacha Klejstan would then have another penalty saved but Mr. Lloyd Sam scored what would become the game-winner in the 39th minute. RBNY then missed several chances in the second half and Didier Drogba pulled one back in the 68th. It was a nervy final 25 (or so) minutes but the Taurine Lads would, at the end of the day, know the sweet taste of three points. Next up: Toronto on Wednesday. The Canucks will be without Giovinco and, possibly, Altidore and Bradley (all due to National Team commitments). There's no reason why the Red Bulls shouldn't... Yeah, I better stop right there. A bit of a downer at the end, as Sacha Klejstan got into it with new man Gonzalo Veron. Hopefully this one blows over quickly (like the Dax/Ouimette thing did) as Veron will be an important piece of what will be a record-breaking 2016 season. Please click on the top video for the usual drunken comments/predictions. Please click here for a most awesome set of pics from the great Matt Kremkau (slide show here) which includes the best photo yet (imho) of The Cathedral of Football in all her glory. I got there very late (and I wasn't alone) due to my son's High School team having an away game down in Lawrenceville. But it was another great time at a (half full) Cathedral of Footbal (Red Bull Arena, built by Makita). One more home game left (Sunday, October 18th at 3pm), so I hope every RBNY fan in the tri-state areal will be able to make it.